Providing the Portland area with professional, fast and eco-friendly junk removal services. These reviews all touch on the many terrific aspects of hiring Junk King Portland. The teams working for Junk King are always friendly and great problem solvers. 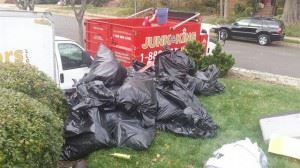 There probably isn’t a junk removal task you could throw to them that they haven’t already experienced. As for the pricing, that is determined by how they’ll pack up the truck with all your stuff. It’s all about the volume and not about the weight. Are you ready to add your positive review? You will after one session with Junk King Portland. This entry was posted in Portland junk recycling and tagged junk King Portland, Junk removal, reviews, rubbish on July 31, 2017 by Junk King. Last updated July 31, 2017 .